Kai Nagae (Mahiro Takasugi) is a middle school student who lives in Urayasu, Chiba. Kai is a promising violinist. His music teacher Chihiro (Misato Tanaka) tells Kai to find his own sound early, but what is his own sound? Although Kai wants to concentrate on his musc, he is unable to do so because of his family. Kai's family is a musical family. 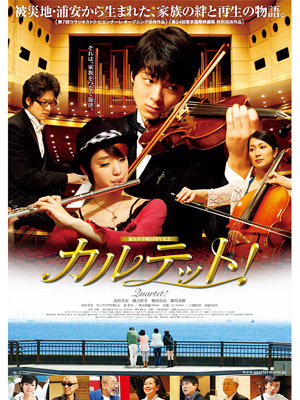 His father Naoki (Shigeki Hosokawa) plays the piano, his mother Hiromi (Mayu Tsuruta) plays the cello and his sister Misaki (Ayame Gouriki) plays the flute. Naoki and Hiromi married back when they were college students majoring in music. To settle down as a couple they had to give up their hopes of becoming musicians. Also, Kai's sister Misaki has an inferiority complex. Kai seems to be naturally gifted with music and Misaki feels their parents ignore her talents. Because of this, Misaki is about to give up on music. Making matters worse, Naoki is laid off from work. The family feels like they are about to collapse at any moment. Hiromi now works in the fish market, while Naoki stays home. One day, Kai comes home from school and hears the sound of the piano. Kai quietly walks to towards the sound and then sees his father in front of the dust covered piano. Naoki is staring at an old family picture. Kai seeing his father in such a lonely state gets the impetus to do something about their family situation. The family will form a musical quartet! Kai persuades the family members to take part in his idea and slowly they come around to the idea. Meanwhile, Takashi Kitahara (Mikihisa Azuma) is a friend of Hiromi and a rival of Naoki back in their university days. He is now a world renown musical conductor. Takashi vists Hiromi. He also listens to Kai's music. After listening to Kai's music, Takashi makes a proposition to Hiromi.